The official opening of the Christmas festivities in Gozo, is taking place on Saturday, 5th December 2015 by the Minister for Gozo Dr Anton Refalo, who will switch on the Christmas Tree, the lights of Republic Street, Victoria and various other Christmas illuminations. The event, which gets underway at 7.30pm, will be accompanied by two choirs of young children and will close with D Capital' Band' in concert in Independence Square, Victoria. The opening of seventh edition of Bethlehem in Ghajnsielem is approaching and preparations are well under way with work taking place both at Ta' Passi fields, the site of the Nativity Village, as well as behind the scenes, with several promotional campaigns and the publishing of informational material. 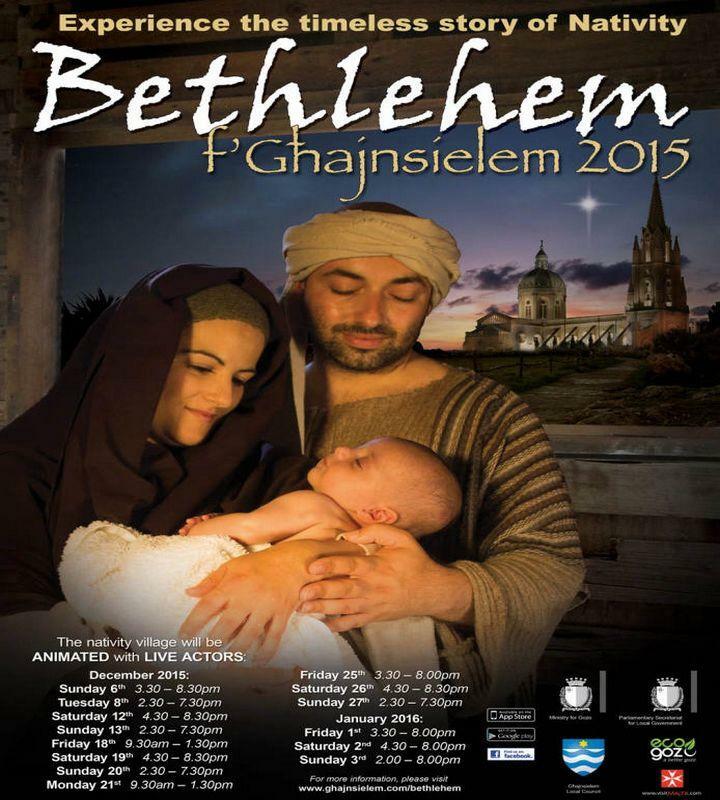 The official poster of Bethlehem f'Ghajnsielem 2015 has been launched and will be used in all marketing material. Among the new attractions for this year, is a new rope-bridge leading to the fisherman's boat. For this year, the organisers are giving the general public the opportunity to take part as actors during the opening hours. Those interested should contact the Ghaqda Drammatika Ghajnsielem on +356 9947 9612 by not later than Monday, the 30th of November. The Nativity Village has its official opening on the 6th of December by the Minister for Gozo, Dr Anton Refalo. The ceremony will start with a Christmas concert by the St Joseph Band of Ghajnsielem, starting at 3.30pm. Once again the event will be animated on weekends and Public Holidays as per details shown on the official poster.